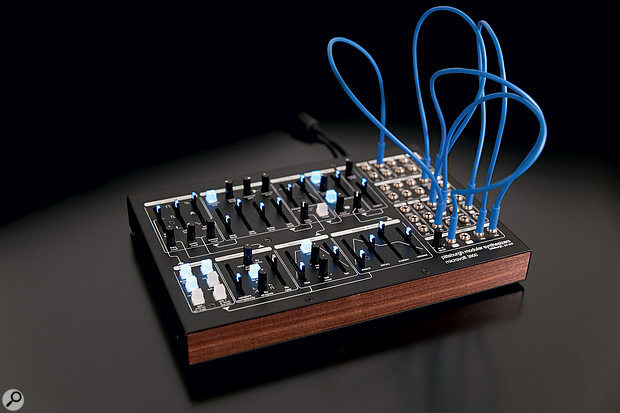 The Microvolt 3900 is a monophonic synthesizer in a chunky steel desktop box that also sports a lump of wood at the front to reassure you of its analogue credentials. It comprises a single 1V/oct oscillator, a low-pass filter and an unusual VCA section, all controlled by an LFO, a random CV source, a looping AD 'Function Generator' and an ADSR contour generator. It also includes an arpeggiator that offers a limited 16-step sequencing capability. All of this is sensibly pre-patched within the synth, but a 39-socket patchbay elevates it to semi-modular status, particularly since you can interrupt the signal path to create new audio routes as well as new modulation possibilities. The sockets themselves are all 3.5mm, which makes it physically compatible with most Eurorack equipment, and the CVs and gate voltages are chosen so that you should have no problem hooking it up to such as system. For clarity, inputs are shown by a box around the text, while outputs are shown using plain text. The single VCO generates four underlying waveforms: sine, sawtooth, pulse and 'fold'. The unadulterated sine wave is a little brighter than a pure tone, while switching on the Harmonic Sine function creates a considerably brighter waveform that, on the 'scope, looks much like an unrectified half-wave. The sawtooth is closer to the ideal, and is bright and raspy. The pulse wave has a minimum static duty cycle of around 6 percent, and a maximum of around 94 percent, but you can drive it down to 0 percent and up to 100 percent using pulse-width modulation. Fold is interesting because this starts with a sine wave and (as the name suggests) increases the amplitude and folds the waveform into more complex shapes as you increase the Fold Timbre level. Without resorting to patch cables, you can modulate the oscillator's pitch, the pulse width, and the amount of fold using the output from the Modulation Sources section, which we'll address in a moment. But if you want to go further, there are CV inputs in the patchbay for pitch, FM, pulse width and the Fold Timbre, and you can use these to create subtle or extreme modulation effects. The manual states that the oscillator's frequency range is variable from sub-audio to ultrasonic, and my tests showed that I could drive it down to frequencies that are best describes in terms of seconds/cycle, and up to 20kHz and beyond, which is a phenomenal range. However, this was also when I discovered that the 3900 has no coarse tuning control. The fine-tuning fader offers a total range of 13 semitones but, if you want to sweep the frequency over a wider range, you'll have to patch a suitable CV into the oscillator FM input. You can mix any combinations and amounts of the four waves within the Waveform Mixer, which also allows you to add noise (which is, strictly speaking, generated within the Modulation Sources section) and external audio. The input for the external audio is in the patchbay, and the Mixer allows you to set its preamp gain as well as the level injected into the signal path. This makes it possible to obtain overdriven sounds at sensible levels, whether derived from external audio or (with suitable patching) from the internally generated waves. Following the Waveform Mixer, the signal reaches the so-called Binary Filter. This is a 12dB/oct low-pass filter that offers the expected cutoff and resonance controls as well as a cutoff frequency modulation CV input. I measured its cutoff frequency to range from 12Hz to more than 21kHz, which means that, with patching and careful setting up, you can also use it as an audio oscillator.